Bake me a picture: The start of a new project ... but it's all under wraps! part one. The start of a new project ... but it's all under wraps! part one. I will be creating a Hogwarts castle after I finish work this evening (pesky job getting in the way! ), but have spent some time up until now creating the figurines which will sit in various locations of the castle. I wanted to pop up a few pictures up for these as I think they are rather cute, and I'm very excited about continuing the creation of the remaining characters, and the cake itself. From left to right; Hermione, Harry and Ron, who need a little work, as Hermione is currently perhaps a little tall, and I think it is rather mandatory that Harry has at least a pair of glasses and a scar added. 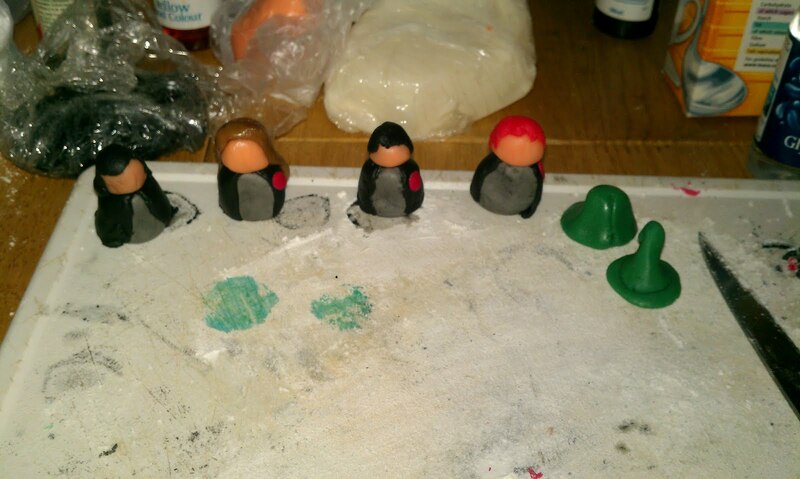 I have also created a snape, on the far left in the picture above, and started working on Professor McGonagall, the two pieces on the far right make up her body, and hat. I made them using fondant icing, which I have rolled into slightly elongated balls, for the bodies, which I then flattened the bottom against a board. I then rolled out fondant from which I cut the capes, ensuring a neat and tidy finish. 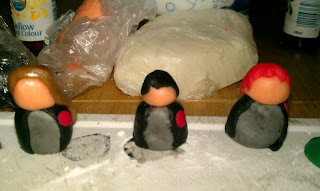 The heads are small balls of fondant, which I have then added, rolled out and cut pieces too, to create hair. Professor McGonagall's hat was made from a flattened ball with a rolled cone shaped piece of fondant stuck on top, I then folded over the top edge of the cone, to give the hat a slightly more worn look. I will be adding her head with some hair tied in a bun later this evening, before placing the hat on top ... fingers crossed! 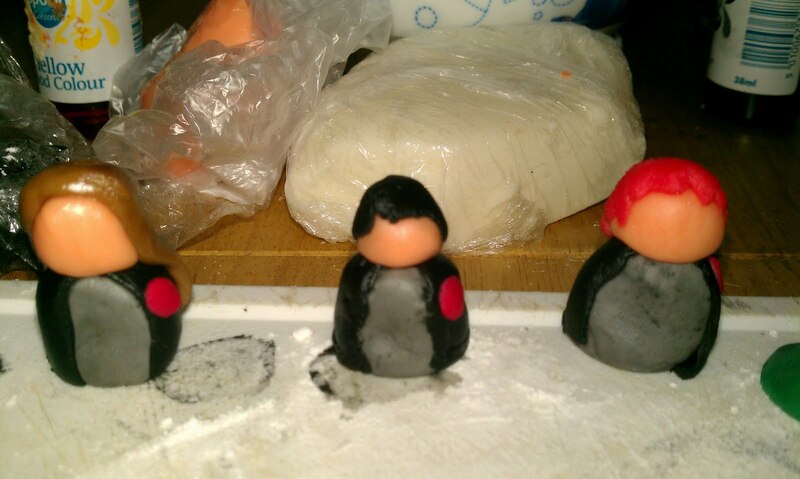 These figures will be quite dried out when the cake is eaten, so they probably won't be edible, but I am enjoying the cute look that they will bring to the finished cake. Watch this space for part 2 when I will post up the final pictures of the whole cake! Castle and all .... I am very excited!